Gloria worked as a Deputy Assessor for Rockton, Township for 13 years and then became the Assessor for eight years. She also loved working in the gift shop as a volunteer for Rockford Memorial Hospital. 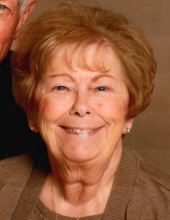 Gloria was a member of St. Peter Catholic Church, the American Legion Woman’s Axillary Post 332 and the Rockton Woman’s Club where she served as treasurer. She loved traveling to the Caribbean. Holidays were her specialty with her family. Gloria donated to Gift of Hope. To send flowers or a remembrance gift to the family of Gloria J. Stien, please visit our Tribute Store. "Email Address" would like to share the life celebration of Gloria J. Stien. Click on the "link" to go to share a favorite memory or leave a condolence message for the family.